Yamaha began in 1887 in Japan producing reed organs in 1899 and pianos in 1900. Soon thereafter the Yamaha family started diversifying into production of many other consumer products including furniture, audio equipment, guitars, motorcycles, band instruments, boats, motors, and resorts throughout Japan. Today Yamaha is a highly diversified company. Some feel they are so diversified that their focus is mainly on shareholder return on investment as opposed to the quality of each product category. Globalization has had many effects on all industries including the piano industry. Yamaha pianos today are built in many different countries and even the “Made in Japan” models are built with piano components from other countries like Indonesia, China, and others. Many pianists advise to purchase a Yamaha originally built in the 1970 and 1980 “sweet years” before globalization took effect. Yamaha pianos in those years were engineered in Japan, all components were made in Japan, and all assembly took place in Japan under very tight quality conditions. To heighten your investment value, if available, purchase a Japan factory re-serviced piano. These pianos play and sound like a brand new one. Many of these pianos include a factory warranty of the original length. Purchase the size not only right for you now but for several years of piano education into the future. Purchase the piano, if possible, which will take the player from beginning to professional without having to replace the piano along the music learning journey. Your piano talent will benefit greatly from this. An adjustable bench allows proper height of one’s body to the piano. Select one with your piano. 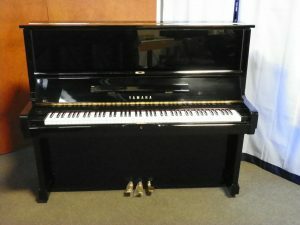 Purchase a Yamaha piano from a source that gives you recourse, markets quality instruments, has an outstanding reputation in the community and has represented only pianos for many years. A warranty on the piano to protect your investment adds assurance to your purchase. Don’t allow “seasoned for destination” to steer you in the wrong direction. Piano industry experts know this claim is completely false. You will most likely hear this inaccurate information from a company that is responsible for the sale of NEW Yamaha pianos. Realize you will only hear this exclusively in the United States where used, “like new” Yamaha pianos are plentiful. If you’re in the market for a Yamaha upright piano or any other new or used model, don’t hesitate to call the experts at England Piano. We’ve been serving the Atlanta area for over 40 years. Call us today at (770) 451-1725 or you may contact us for more information.